I have an old recipe box made of hand-rubbed walnut wood that I covet. 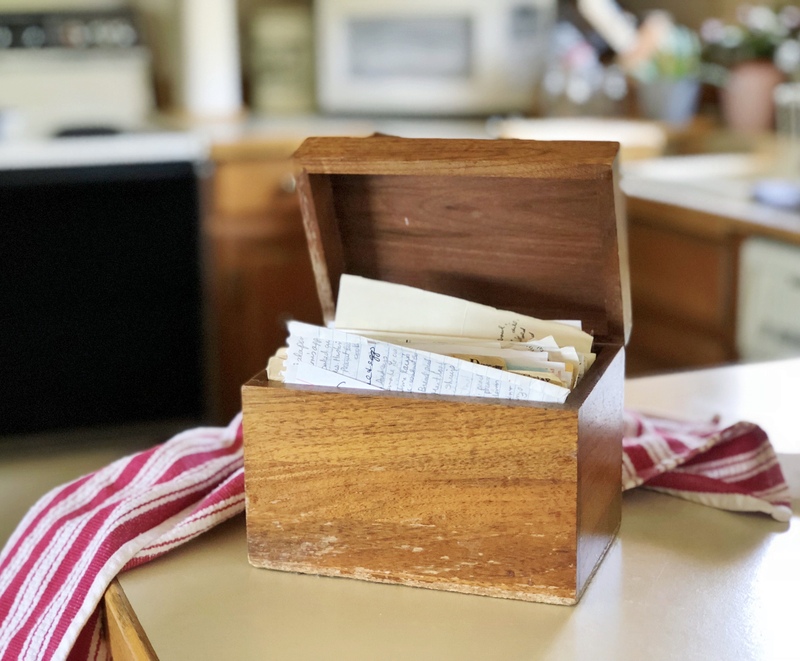 It’s filled with family treasures scrawled in my ancestor’s original hand on stained and yellowed index cards, and wispy sheets of paper that somehow survived the years. Holding the recipes in my hand is like holding a piece of my personal history. I often thumb through the archives and find myself transported. 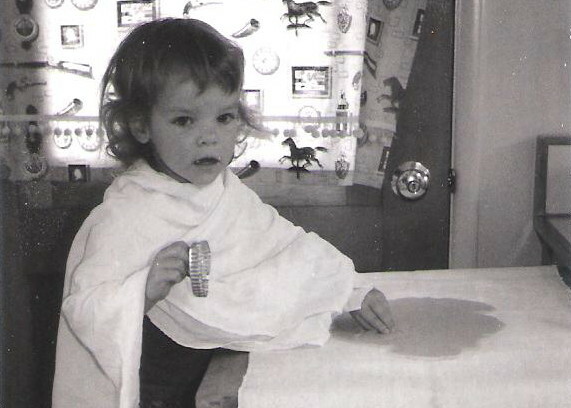 All at once I am five years old again standing beside my Mom rolling out sugar cookie dough with my sister—flour sack towels tied around our necks in place of aprons. Or I’m being carried through the door of Grandma’s house at Thanksgiving as a child, half asleep, to be greeted by the aroma of her fresh baked mincemeat tarts. Then there is the card marked “Ranger Cookies,” written in my great-Grandmother’s beautiful penmanship, that conjures the memory of her well-worn hands shaping spoonfuls of raw dough into balls, and spacing them perfectly on a greased cookie sheet. Most of these heirloom recipes are for baked goods. Baking was the way women comforted their families, and the scents emanating from the oven were the bosom of hearth and home. Those same familiar kitchen smells can still bring me back to a sense of place that is the essence of home. There’s something genuinely comforting about old recipes. They have withstood the test of time for a reason, because generations have enjoyed them and passed them down. More often than not there is a story to go with them that adds to their charm, and the telling has probably been embellished from cook to cook (but no one really minds). One of my favorite summer recipes is an oldie that did not originate in my family’s kitchen, but it is a goodie none-the-less. I discovered Apricot Pie for Mr. Kerr while reading a memoire piece written by Jacqueline Higuera McMahan published in 1998 by SFGate. In it, she reflects on her family home, and the meals prepared there, as she cleaned out the kitchen drawers following her father’s death. Pushed way to the back of the cupboard are a stack of Mama’s pie tins, which gave us so many flaky apricot pies. Those pies: We ate so many that we swore we never wanted another . . . and now I would give almost anything to have one again. 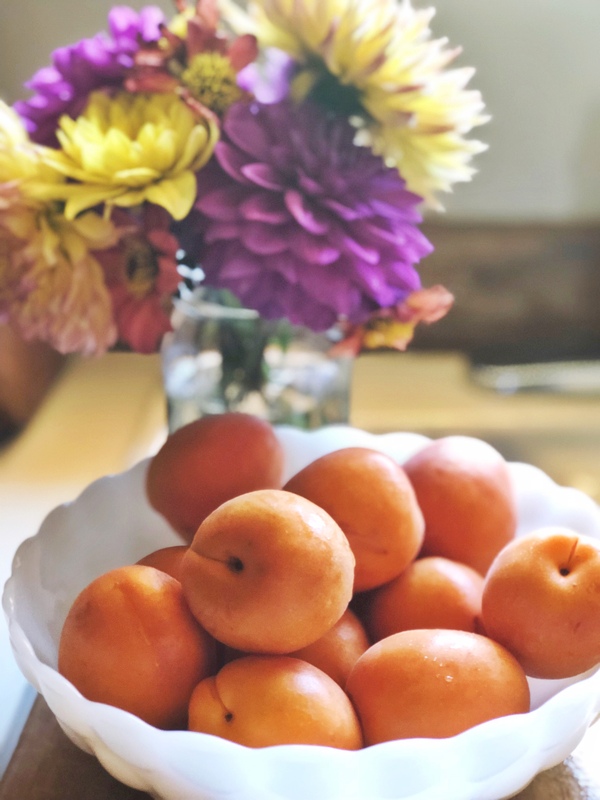 I remember the time our neighbor Mrs. Kerr invited Mama to come over and pick apricots from her backyard tree. Mr. Kerr wouldn’t hear of Mama climbing the ladder to get the cots from the top of the tree, so, in his suit pants and starched white shirt, he began picking. His wife would kill him, he said, if his shirt got dirty. Just at that moment, the fattest, ripest, most gargantuan apricot went splat on his shirt front. Mama and her accomplice, my aunt, started to giggle as Mr. Kerr flew off the ladder and into the house to wash his shirt before his wife got home. Of course, Mama made him an apricot pie to ask his forgiveness. 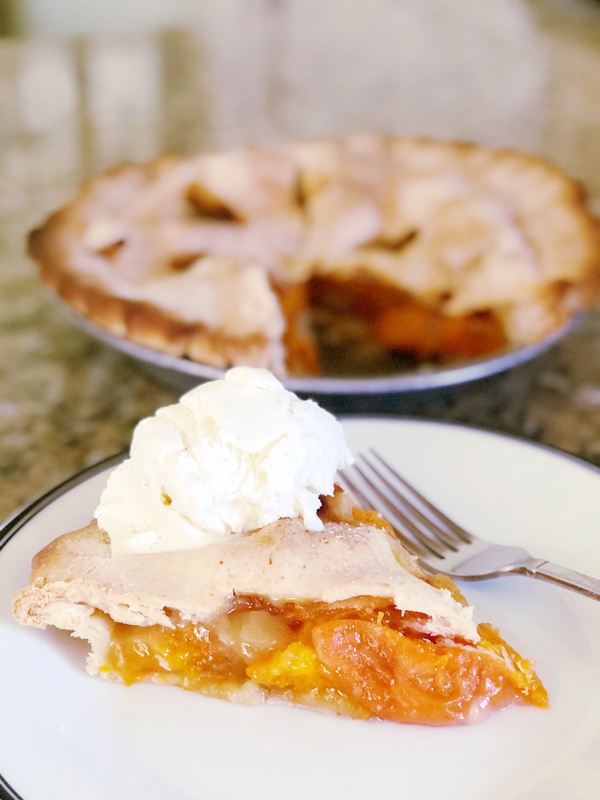 As we near the end of another apricot season, I can’t resist resurrecting Jacqueline’s pie recipe. It’s been a favorite since I first baked it for a friend years ago on his birthday. He has raved about that pie ever since. From her archives, to my oven, the tradition continues— and finds new life in generations to come. When the mixture is still in large pieces, use your fingertips to rub flour and shortening together. When ready, the crumbs should be the size of the tip of your little finger. Drizzle 4 tablespoons ice water over the top of the dry mixture. Using a 2-tined fork, quickly blend. Sprinkle 2 more tablespoons of ice water on any dry spots. Pinch dough together. If there is still a dry spot, add another tablespoon of ice water. Wrap the dough in plastic wrap. Flatten into a large disc with the heel of your hand. Divide the dough in half; place one half on a board lightly sprinkled with flour and a tablespoon of sugar. 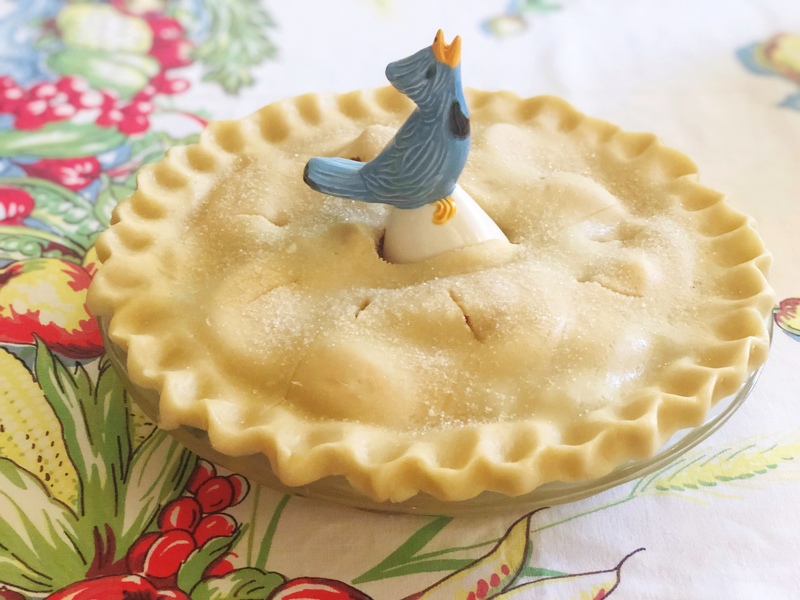 Using a rolling-pin or empty wine bottle, roll from the center until the pastry is at least 1 1/2 inches larger than your pie tin (use a 9 or 10 inch tin). Fold the pastry in half and fit into the pie tin, allowing excess dough to hang over the edge of the tin. 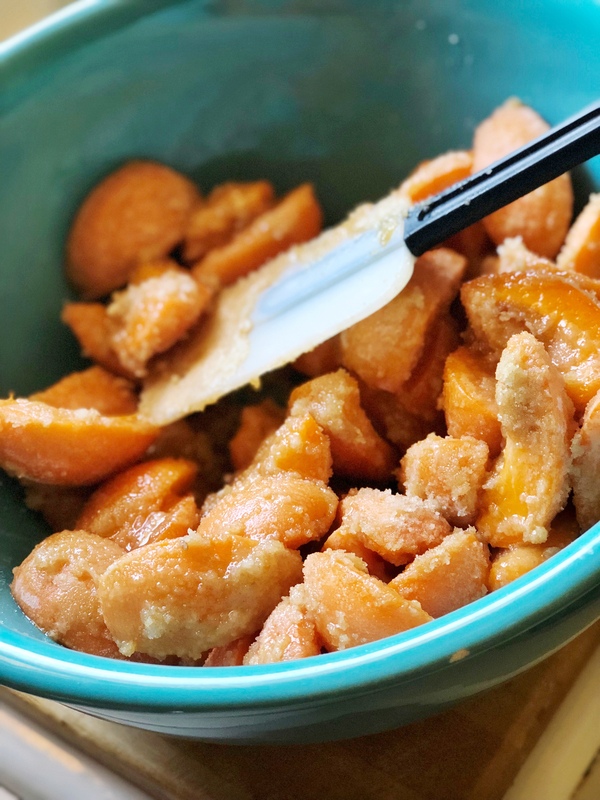 Combine the apricots, both sugars, the lemon juice, almond extract and flour. 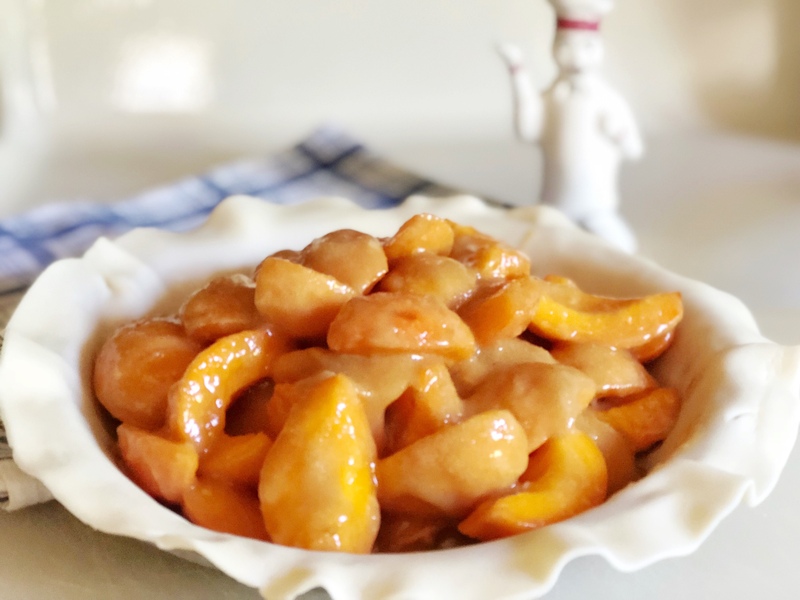 Mix and spoon the apricot mixture into the unbaked pie crust. Fit the dough circle over the fruit, pinching the edges over and under the bottom pastry. Poke steam vents in the top of the pie. Place on the bottom shelf of the oven and bake at 400F degrees for 15 minutes. Reduce oven temperature to 350F degrees and bake for 45 minutes longer, or until the crust is a lovely golden brown. Cool on a wire rack. You’re killing me with all these pie recipes!!! How can you maintain your figure with all these yummy pies!!? ?